One walks through the doorway shown in the 5th image from the top in the previous post. It is a T shaped room with 24 vertical columns. Some say the number 24 stands for the number of hours in a day. Here are some different views. Notice the simplicity of the architecture in here. 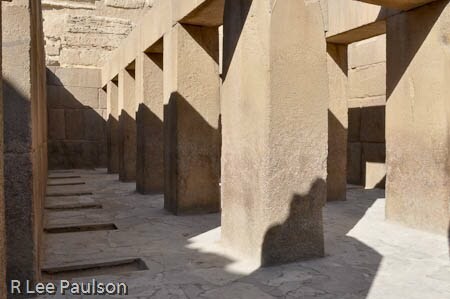 Unlike other temples we visited, there is no decoration at all on the columns or wall. 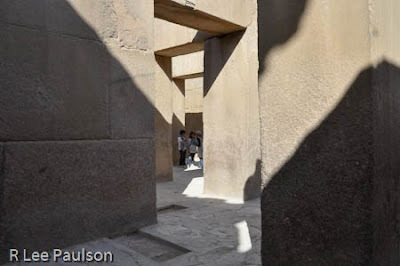 The columns are square where all the other columns in the places we visited, save one, were round. That one exception had architecture very similar to this. Melony in part of the T. Notice the limestone blocks above the granite. One wonders if the granite once went all the way up. 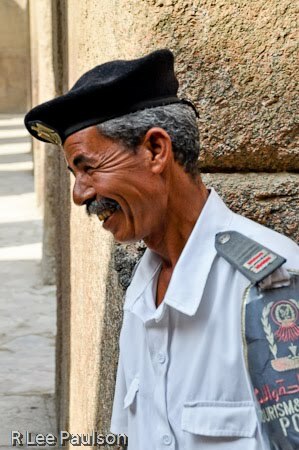 One of the ever present Tourist Police, guarding the temple interior with his customary good humor, typical of most Egyptians we met. 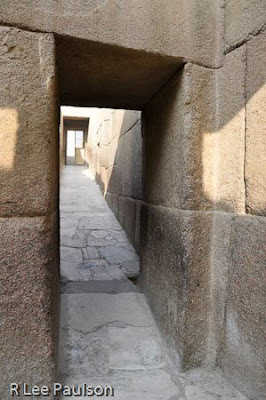 Doorway out of the temple into the Sphinx enclosure. I would make a terrible photo editor for a magazine. There is so much to show that I hate to leave anything out, even though what is shown here is a small fraction of the images I took. 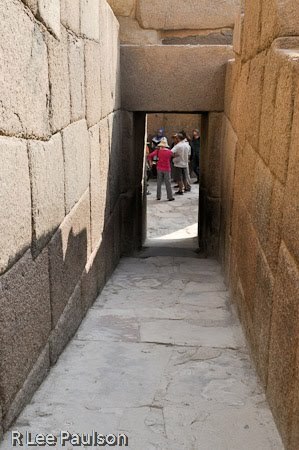 This is a shot from the outside looking back in. I included it so that you can see more details of the way they constructed their walls out of the red granite. Notice that each block is individually cut and fit and there seems to be no set standard size. One has to believe there are good reasons for constructing the walls this way. We just don't have any idea what the reasons were. 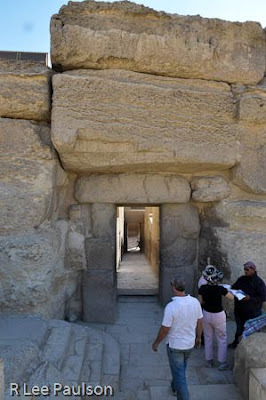 This is a view of the same doorway taken further back from outside the temple in the Sphinx area. The Sphinx is behind me and to my left. 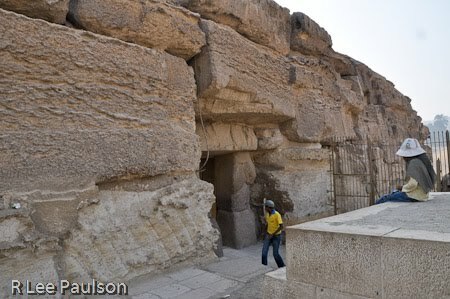 Notice the huge limestone blocks which cover the granite door jams here. This is further back yet and off to the side. The Sphinx is now directly behind me. 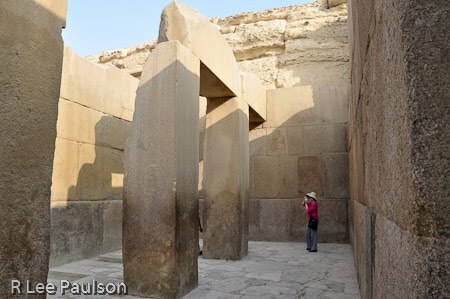 One begins to get a sense of just how large the limestone blocks enclosing the wonderful little temple are. Notice, also, the horizontal pits in the limestone. Those indentations are caused from wind borne sand erosion. Wind borne sand erosion has a distinctive look. I'll show more examples in later posts. The reason I'm talking about erosion will become more clear in the next post. Continue on to Post 4: Sphinx by clicking here.